A few weeks ago I posted a video by YouTuber Napural85 showcasing her mini twists. Feeling somewhat inspired to give mini twists a try, and wanting to give myself a "mini" break from doing my hair, I began twisting and emerged 3 hours later with the smallest twists I've done to date. 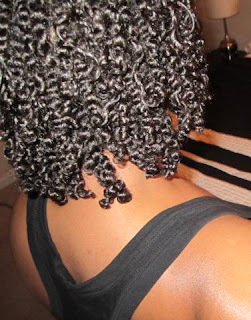 I did my twists on hair that had been previously washed and styled in a twist-out. The most important tip to remember when twisting hair is to start with even sections. Sometimes when twisting your hair you can run out of hair in a section and start to borrow from another. 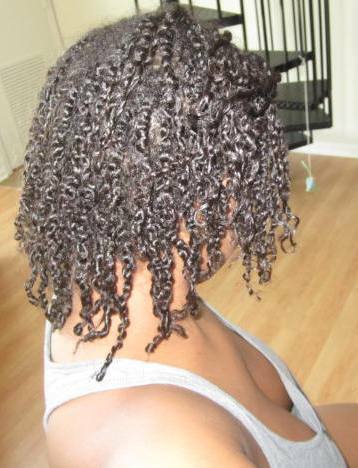 Although this doesn't always affect the way your twists look it will make taking them down a nightmare! I made sure to keep sections separate and when I took my twists down it was a breeze. Naptural85 was able to leave her twists in for a few weeks, but I was only aiming for 7 days at the very most. I kept my twists in for 4 days which was the longest I've worn any style. I was not only proud of myself, but thrilled at the mini break from daily styling. 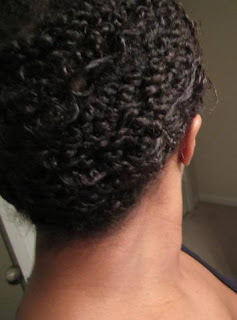 While my hair was twisted I followed Naptural85's method of wrapping my twists at night (similar to how I would wrap my relaxed hair), and used bobby pins to secure the style. This helped to stretch my twists and give some volume. Since my hair is so fine I noticed that by the 3rd day of doing the "wrap at night" method, my hair was super stretched but had very little curl. Day 3 - My twists were limp and lifeless. You can see how super stretched some pieces were in the back. I decided to wash my twists and let water breathe life back into my hair. This proved to work well for plumping my twists back up, but I did notice that washing my twists made them a bit fuzzier. By day 4 I was ready to have my big hair back and bid adieu to the mini twists. Day 4 - After washing my twists they were plump again, but the roots were loose so I decided to take them down. I must say that this style was pretty awesome and I even ventured into the newsroom with my hair twisted. This was the first time I wore my hair in a twisted style, purposely, out of the house. Usually I just throw on a hat and wear a bit of the front out while the rest is in twists, but I was pleasantly surprised at how much easier it was on my hair. In terms of the products I used for my twists - - since my hair was already washed and dry in a day old twist-out, I used a spray bottle of water to dampen each section, detangle, and used my Shea Moisture Curl Enhancing Smoothie, sealing my ends with Lisa's Hair Elixir by Carol's Daughter (probably my favorite oil mix out... and this stuff lasts forever! I've had 1 bottle for over a year). My girlfriend Sexyandthechi also gave mini twists a try after seeing the video, but her goals were way more ambitious than mine - - she wanted to keep her twists in for a few weeks! Did anyone else treat themselves to a hair break by doing mini twists?